Half gallon of certified organic fat free milk delivered fresh to your doorstep. Mom always told us that drinking milk helps build strong bones. If we didn’t drink our milk every day, we’d have to eat ten cups of raw spinach to get the same amount of calcium in a glass of milk. (We obviously chose the milk.) With Smith Brothers Farms’ Organic Fat Free Milk, you’ll get all the essential nutrients needed to grow strong bones. To ensure a great taste, we source our rBST-free and non-GMO milk from healthy, happy cows that have been pasture-raised on local Pacific Northwest farms. 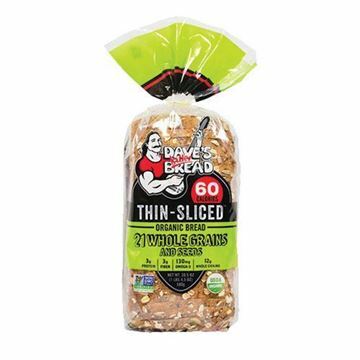 Dave's Killer Bread 21 Whole Grains - Thin Sliced - 20.5 oz. Thin slices of organic bread packed with whole grains and seeds. Even though I had to change to skim milk, the brothers still prove they have the best tasting milk I've ever had. I'm 61 years old and still have milk every day, the brothers are the best! though often people find fat free milk to be clear and watery, that is NOT the case with this milk. It is creamy and delicious!